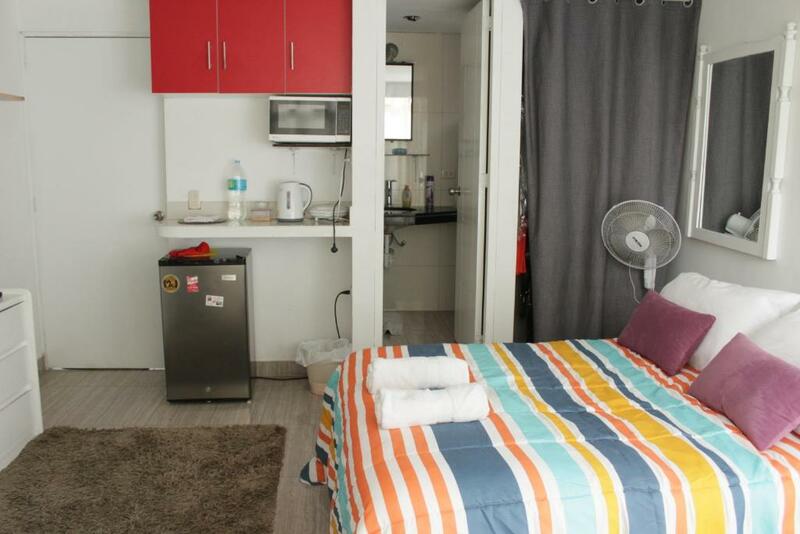 The rooms are simple, but with good space, microwave and freezer. Is good for those that need to make business around, or go to the U.S, Embassy. The hotel is a house with few rooms, and is under construction to add a new floor and add more rooms. Therefore, during the day is not good to be there, because of the noise. Our room was not finished yet, so the entrance door was Provisory, with an open space in the upper side. However, the space and confort of the beds, cleaning of the towels and the personalized attention of the owner, make it a good experience. 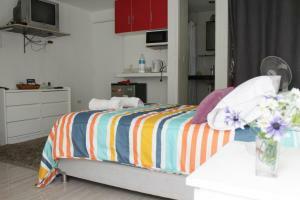 Daily cleaning of this apartment and bed arranged as housekeeping services in hotels. Nice neigbourhood, with convenient stores very close, in front of a small community park. Private terrace to enjoy warm evenings. La ubicación y la cercania a las tiendas. Frente al parque, zona muy tranquila. El señor Figueroa muy amable, súper servicial. El Sr. Figueroa me estuvo esperando para entregarme la llave. 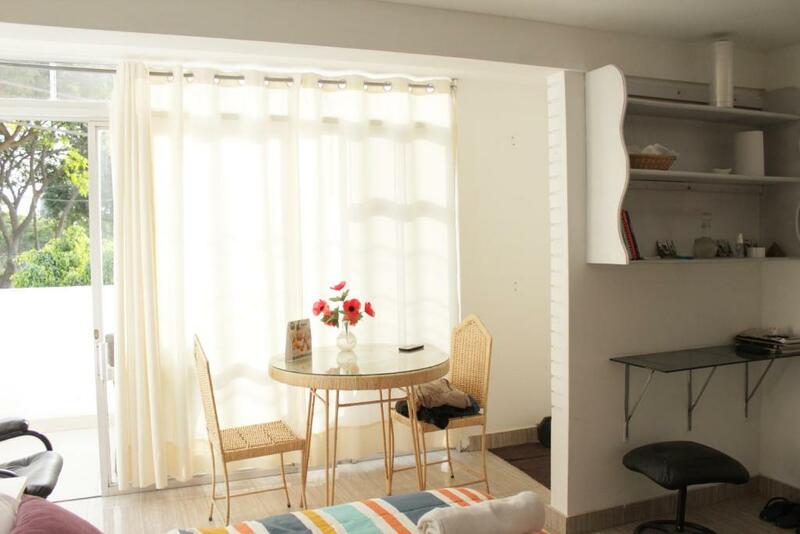 El sitio es muy tranquilo, aunque las fotos del apartment aparentan que fuera un poco más grande. Pero lindo sitio, acogedor. Definitivamente recomendado! 100/100% Los anfitriones demasiado amables y serviciales! 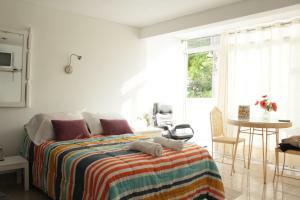 La habitación muy acogedora y con todos los servicios con una excelente ubicación! Vale la pena y a un muy buen precio! Gracias por todo lo que hicieron por nosotros! GENTE NO ESPEREN MAS, DENLE CLIC A RESERVAR! El precio y la ubicación. El trato de la anfitriona. Muy amable la atención del Señor Figueroa, muy dispuesto a ayudar en lo que se necesitara (mas allá de sus responsabilidades). El vecindario donde está ubicado es muy tranquilo y seguro (la casa está frente a un parque) y hay muchos comercios cerca como farmacias, tiendas de aborrotes, restaurants, salon de belleza, etc. A mi me resultó excelente pues estaba ubicado a 200 metros donde tenía mi actividad de trabajo, me iba caminando, por lo que me ahorré tiempo de tráfico y taxis. El tráfico el Lima es realmente muy pesado. Para ir a sitios como el centro (turistear) está un poco alejado, pero en mi caso lo compensaba la cercanía al evento de trabajo, la tranquilidad y seguridad del lugar. Recomendable 100%. Lock in a great price for Mario Figueroa- Monterrico Suites Hotel – rated 8.5 by recent guests! Mario Figueroa Apart Hotel is located in Monterrico, in the distrit of Surco, four blocks from the United States Embassy and the Peruvian Golden Musseum. Free WiFi is provided. All units have a TV with cable channels. Some units feature a terrace and balcony and others has a living room. 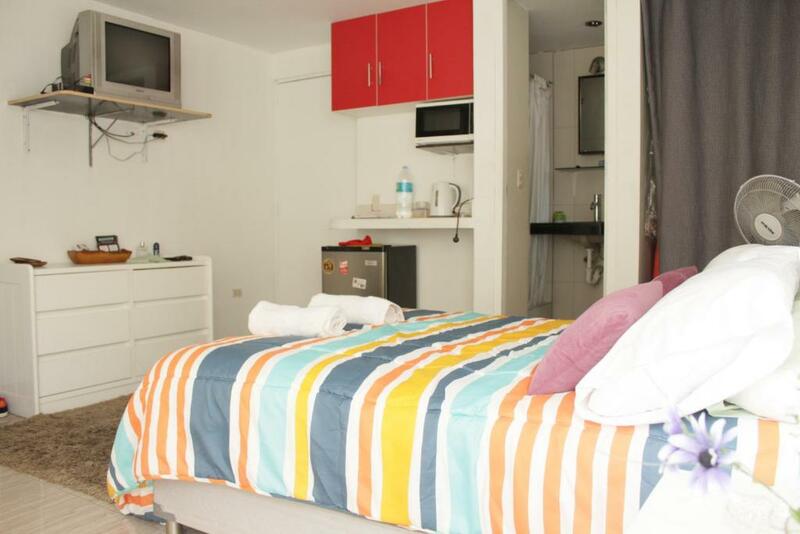 The rooms are equipped with a microwave and a freezer, with a private bathroom with shower. Towels and bed linen are offered. 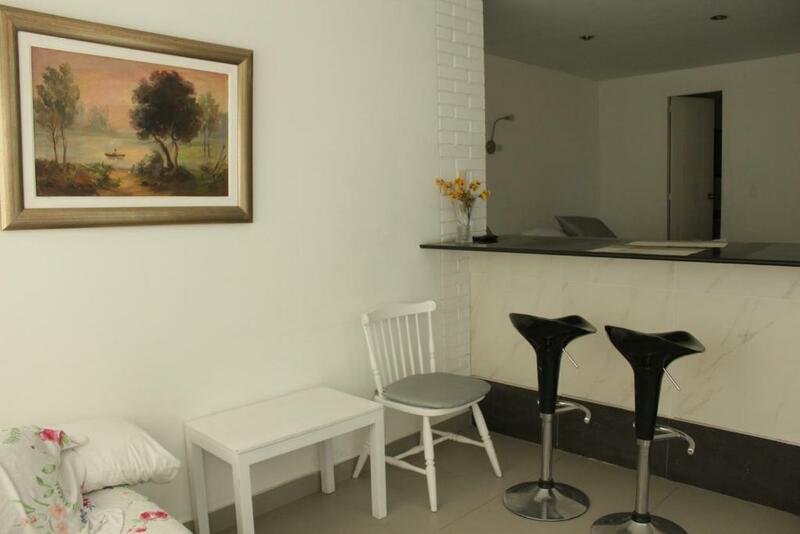 The property is near Comercial Centers of Lima, the Jockey Plaza, El Golf and Monterrico. Museum of the Nation is 2.5 mi from the property. Larcomar is 4.3 mi from Mario Figueroa. The nearest airport is Jorge Chavez International Airport, 16 mi from the property. Santiago de Surco is a great choice for travelers interested in tourist attractions, sightseeing and friendly locals. When would you like to stay at Mario Figueroa- Monterrico Suites Hotel? Estamos en una zona muy segura, tranquila, residencial y bonita, rodeada de centros comerciales y centros empresariales muy modernos. Soy Contador Publico y practico el futbol. Estamos frente a un lindo parque donde se puede realizar ejercicios físicos, caminatas y footing, rodeado de mucha vegetación y arboles. 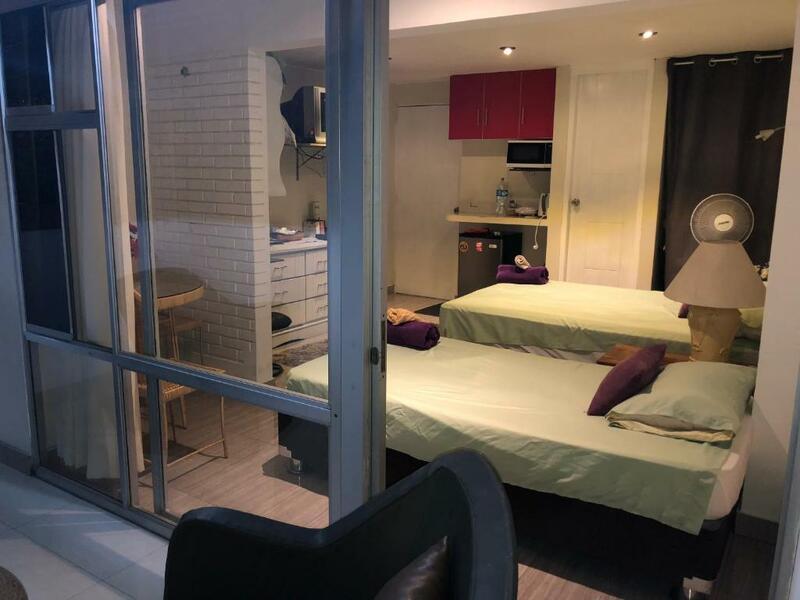 Area Info – This neighborhood is a great choice for travelers interested in tourist attractions, sightseeing and friendly locals – Check location Excellent location – show map Guests loved walking around the neighborhood! House Rules Mario Figueroa- Monterrico Suites Hotel takes special requests – add in the next step! Guests need be quiet between 6:00 PM and 8:00 AM. Please inform Mario Figueroa- Monterrico Suites Hotel of your expected arrival time in advance. You can use the Special Requests box when booking, or contact the property directly using the contact details in your confirmation. The kitchen corner has nothing to cook even some noodles or eggs. You can just use it for simple beakfast or heat up snacks. Hydroelectrical pump that is propably located on the flat roof above the bedroom always start/stop all night long making such an annoying sound to really enjoy the quietness of the apartment neigbourhood !! The TV was and old one, with few channels to choose. Because of te openings in the door and the kitchen, at our arrival it was dusty because of the works. Because of the excellent location, in front of a square, and one block from Av. Encalada and comparing with the price (check the Polo hotel), if you want to save money, this is a very good option for you. Mario is a so nice gentle man,he can speak english and spanish,that help a lot since I can only speak english.He even gave me a free ride to tour the township and ride me to the airpoort. It was a wonderful business time for me.